It has been suggested that this article be merged with Plurality voting. (Discuss) Proposed since February 2018. A first-past-the-post (FPTP and sometimes abbreviated to FPP) electoral system is one in which voters indicate on a ballot the candidate of their choice, and the candidate who receives the most votes wins. This is sometimes described as winner takes all. 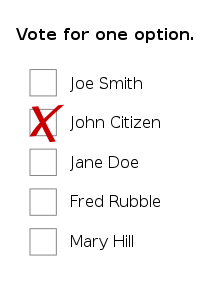 First-past-the-post voting is a plurality voting method. FPTP is a common, but not universal, feature of electoral systems with single-member electoral divisions, and is practiced in close to one third of countries. Notable examples include Canada, India, the United Kingdom, and the United States, as well as most of their current or former colonies and protectorates. First-past-the-post voting methods can be used for single- and multiple-member electoral divisions. In a single-member election, the candidate with the highest number (but not necessarily a majority) of votes is elected. In a multiple-member election (or multiple-selection ballot), each voter casts (up to) the same number of votes as there are positions to be filled, and those elected are the highest-placed candidates corresponding to that number of positions. For example, if there are three vacancies, then the three candidates with the greatest numbers of votes are elected. In the U.S., all states (except for Maine and Nebraska) and the District of Columbia use a winner-take-all form of simple plurality, first-past-the-post voting, to appoint the electors of the Electoral College; Maine and Nebraska use a variation where the electoral vote of each Congressional district is awarded by first-past-the-post, in addition to the statewide winner taking two votes. In winner-take-all, the presidential candidate gaining the greatest number of votes wins all of the state's available electors, regardless of the number or share of votes won, or the difference separating the leading candidate and the first runner-up. The multiple-round election (runoff) voting method uses first-past-the-post voting method in each of two rounds. The first round determines which candidates will progress to the second and final round. In this example, Labour took a majority of the seats with only 36% of the vote. The largest two parties took 69% of the vote and 88% of the seats. In contrast, the Liberal Democrats took more than 20% of the vote but only about 10% of the seats. Here, the Conservatives took 51% of the seats with only 37% of the vote. Of the smaller parties, the SNP received a greater share of seats than votes, whereas UKIP and the Liberal Democrats gained very little representation compared to the share of the vote they received. The benefits of FPTP are that its concept is easy to understand, and ballots can more easily be counted and processed than in preferential voting systems. First past the post's tendency to produce majority rule allows a government to pursue a consistent strategy for its term in office and to make decisions that may have socially beneficial outcomes, but be unpopular. Tony Blair, defending FPTP, argued that other systems give small parties the balance of power, and influence disproportionate to their votes. Allowing people into the UK parliament who did not finish first in their constituency was described by David Cameron as creating a "Parliament full of second-choices who no one really wanted but didn't really object to either." Winston Churchill criticised the electoral outcomes of the alternative vote as "determined by the most worthless votes given for the most worthless candidates." Supporters also argue that electoral systems using proportional representation (PR) often enable smaller parties to become decisive in Parliament, thus gaining a power of leverage against the Government. FPTP generally reduces this likelihood, except where parties have a strong regional basis. To a greater extent than many others, the first-past-the-post method encourages tactical voting. Voters have an incentive to vote for a candidate who they predict is more likely to win, in preference to their preferred candidate who may be unlikely to win and for whom a vote could be considered as wasted. The position is sometimes summarised, in an extreme form, as "all votes for anyone other than the runner-up are votes for the winner." This is because votes for these other candidates deny potential support from the second-placed candidate, who might otherwise have won. Following the extremely close 2000 U.S. presidential election, some supporters of Democratic candidate Al Gore believed that one reason he lost to Republican George W. Bush is because a portion of the electorate (2.7%) voted for Ralph Nader of the Green Party, and exit polls indicated that more of them would have preferred Gore (45%) to Bush (27%). This election was ultimately determined by the results from Florida, where Bush prevailed over Gore by a margin of only 537 votes (0.009%), which was far exceeded by the 97488 (1.635%) votes for Nader. In Puerto Rico, there has been a tendency for Independentista voters to support Populares candidates. This phenomenon is responsible for some Popular victories, even though the Estadistas have the most voters on the island, and is so widely recognised that Puerto Ricans sometimes call the Independentistas who vote for the Populares "melons", because that fruit is green on the outside but red on the inside (in reference to the party colors). The method may promote votes against as opposed to votes for. 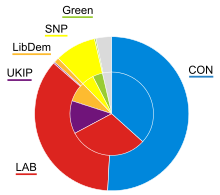 For example, in the UK (and only in the Great Britain region), entire campaigns have been organised with the aim of voting against the Conservative Party by voting Labour, Liberal Democrat in England and Wales, and since 2015 the SNP in Scotland, depending on which is seen as best placed to win in each locality. Such behaviour is difficult to measure objectively. Proponents of other voting methods in single-member districts argue that these would reduce the need for tactical voting and reduce the spoiler effect. Examples include preferential voting systems, such as instant runoff voting, as well as the two-round system of runoffs and less tested methods such as approval voting and Condorcet methods. However, most countries with first-past-the-post elections have multiparty legislatures, the United States being the major exception. There is a counter-force to Duverger's Law, that while on the national level a plurality system may encourage two parties, in the individual constituencies supermajorities will lead to the vote fracturing. Wasted votes are seen as those cast for losing candidates, and for winning candidates in excess of the number required for victory. For example, in the UK general election of 2005, 52% of votes were cast for losing candidates and 18% were excess votes – a total of 70% 'wasted' votes. On this basis a large majority of votes may play no part in determining the outcome. This winner-takes-all system may be one of the reasons why "voter participation tends to be lower in countries with FPTP than elsewhere." Because FPTP permits many wasted votes, an election under FPTP is more easily gerrymandered. Through gerrymandering, electoral areas are designed deliberately to unfairly increase the number of seats won by one party, by redrawing the map such that one party has a small number of districts in which it has an overwhelming majority of votes, and a large number of districts where it is at a smaller disadvantage. The presence of spoilers often gives rise to suspicions that manipulation of the slate has taken place. A spoiler may have received incentives to run. A spoiler may also drop out at the last moment, inducing charges that such an act was intended from the beginning. First-past-the-post within geographical areas tends to deliver (particularly to larger parties) a significant number of safe seats, where a representative is sheltered from any but the most dramatic change in voting behaviour. In the UK, the Electoral Reform Society estimates that more than half the seats can be considered as safe. It has been claimed that MPs involved in the 2009 expenses scandal were significantly more likely to hold a safe seat. However, other voting systems, notably the party-list system, can also create politicians who are relatively immune from electoral pressure. The winner-takes-all nature of FPTP leads to distorted patterns of representation, since party support is commonly correlated with geography. For example, in the UK the Conservative Party represents most of the rural seats, and most of the south of the country, and the Labour Party most of the cities, and most of the north. This means that even popular parties can find themselves without elected politicians in significant parts of the country, leaving their supporters (who may nevertheless be a significant minority) unrepresented. It has been suggested that the distortions in geographical representation provide incentives for parties to ignore the interests of areas in which they are too weak to stand much chance of gaining representation, leading to governments that do not govern in the national interest. Further, during election campaigns the campaigning activity of parties tends to focus on marginal seats where there is a prospect of a change in representation, leaving safer areas excluded from participation in an active campaign. Political parties operate by targeting districts, directing their activists and policy proposals toward those areas considered to be marginal, where each additional vote has more value. Scholars rate voting methods using mathematically derived voting method criteria, which describe desirable features of a method. No ranked preference method can meet all of the criteria, because some of them are mutually exclusive, as shown by results such as Arrow's impossibility theorem and the Gibbard–Satterthwaite theorem. Y The majority criterion states that "if one candidate is preferred by a majority (more than 50%) of voters, then that candidate must win". First-past-the-post meets this criterion (though not the converse: a candidate does not need 50% of the votes in order to win). Although the criterion is met for each constituency vote, it is not met when adding up the total votes for a winning party in a parliament. N The Condorcet winner criterion states that "if a candidate would win a head-to-head competition against every other candidate, then that candidate must win the overall election". First-past-the-post does not meet this criterion. N The Condorcet loser criterion states that "if a candidate would lose a head-to-head competition against every other candidate, then that candidate must not win the overall election". First-past-the-post does not meet this criterion. N The independence of irrelevant alternatives criterion states that "the election outcome remains the same even if a candidate who cannot win decides to run." First-past-the-post does not meet this criterion. N The independence of clones criterion states that "the election outcome remains the same even if an identical candidate who is equally-preferred decides to run." First-past-the-post does not meet this criterion. The following is a list of countries currently following the first-past-the-post voting system for their national legislatures. ^ Affairs, The Department of Internal. "More about FPP". www.dia.govt.nz. Retrieved 17 February 2019. ^ "U. S. Electoral College: Frequently Asked Questions". Retrieved 23 October 2015. ^ Presidential Elections Results. Singapore Elections Department. 28 August 2011. ^ Polling Day Voter Turnout. Singapore Elections Department. 28 August 2011. ^ Andy Williams (1998). UK Government & Politics. Heinemann. pp. 24–. ISBN 978-0-435-33158-0. ^ P. Dorey (17 June 2008). The Labour Party and Constitutional Reform: A History of Constitutional Conservatism. Palgrave Macmillan UK. pp. 400–. ISBN 978-0-230-59415-9. ^ Larry Johnston (13 December 2011). Politics: An Introduction to the Modern Democratic State. University of Toronto Press. pp. 231–. ISBN 978-1-4426-0533-6. ^ Ilan, Shahar. "about blackmail power of Israeli small parties under PR". Haaretz.com. Retrieved 8 May 2010. ^ "Dr.Mihaela Macavei, University of Alba Iulia" (PDF). Retrieved 8 May 2010. ^ Rosenbaum, David E. (24 February 2004). "THE 2004 CAMPAIGN: THE INDEPENDENT; Relax, Nader Advises Alarmed Democrats, but the 2000 Math Counsels Otherwise". The New York Times. New York Times. Retrieved 8 May 2010. ^ Dunleavy, Patrick (18 June 2012). "Duverger's Law is a dead parrot. Outside the USA, first-past-the-post voting has no tendency at all to produce two party politics". blogs.lse.ac.uk. ^ Dunleavy, Patrick; Diwakar, Rekha (2013). "Analysing multiparty competition in plurality rule elections" (PDF). Party Politics. 19 (6): 855–886. doi:10.1177/1354068811411026. ^ Dickson, Eric S.; Scheve, Kenneth (2010). "Social Identity, Electoral Institutions and the Number of Candidates". British Journal of Political Science. 40 (2): 349–375. CiteSeerX 10.1.1.75.155. doi:10.1017/s0007123409990354. JSTOR 40649446. ^ Drogus, Carol Ann (2008). Introducing comparative politics: concepts and cases in context. CQ Press. p. 257. ISBN 978-0-87289-343-6. ^ "General Election 2010: Safe and marginal seats". www.theguardian.com. Guardian Newspapers. 7 April 2010. Retrieved 15 November 2017. ^ Wickham, Alex. ""Safe seats" almost guarantee corruption". www.thecommentator.com. Retrieved 15 November 2017. ^ "FactCheck: expenses and safe seats". www.channel4.com. Channel 4. Retrieved 15 November 2017. ^ "First Past the Post". www.conservativeelectoralreform.org. Conservative Action for Electoral Reform. Retrieved 15 November 2017. ^ "First Past the Post is a 'broken voting system'". www.ippr.org. Institute for Public Policy Research. 4 January 2011. Retrieved 15 November 2017. ^ Terry, Chris (28 August 2013). "In Britain's first past the post electoral system, some votes are worth 22 times more than others". www.democraticaudit.com. London School of Economics. Retrieved 15 November 2017. ^ Galvin, Ray. "What is a marginal seat?". www.justsolutions.eu. Retrieved 15 November 2017. ^ Single-winner Voting Method Comparison Chart Archived 28 February 2011 at the Wayback Machine "Majority Favorite Criterion: If a majority (more than 50%) of voters consider candidate A to be the best choice, then A should win." ^ a b c d Felsenthal, Dan S. (2010) Review of paradoxes afflicting various voting procedures where one out of m candidates (m ≥ 2) must be elected. In: Assessing Alternative Voting Procedures, London School of Economics and Political Science, London, UK. ^ "Countries using FPTP electoral system for national legislature". idea.int. Archived from the original on 6 October 2014. Retrieved 3 December 2018. ^ "Electoral Systems". ACE Electoral Knowledge Network. Archived from the original on 26 August 2014. Retrieved 3 November 2015. ^ Milia, Juan Guillermo (2015). El Voto. Expresión del poder ciudadano. Buenos Aires: Editorial Dunken. pp. 40–41. ISBN 978-987-02-8472-7. ^ "Law 14,032". Sistema Argentino de Información Jurídica. ^ Encarta-encyclopedie Winkler Prins (1993–2002) s.v. "Kiesstelsel. §1.1 Federale verkiezingen". Microsoft Corporation/Het Spectrum. ^ Bhuwan Chandra Upreti (2010). Nepal: Transition to Democratic Republican State : 2008 Constituent Assembly. Gyan Publishing House. pp. 69–. ISBN 978-81-7835-774-4. ^ Encarta-encyclopedie Winkler Prins (1993–2002) s.v. "Kiesstelsel. §1.1 Geschiedenis". Microsoft Corporation/Het Spectrum. ^ "PNG voting system praised by new MP". ABC. 12 December 2003. Archived from the original on 4 January 2005. Retrieved 19 May 2015. ACE Project: What is the electoral system for Chamber 1 of the national legislature? The Citizens' Assembly on Electoral Reform says the new proportional electoral system it proposes for British Columbia will improve the practice of democracy in the province. Fact Sheets on Electoral Systems provided to members of the Citizens' Assembly on Electoral Reform, British Columbia.